So you are thinking about getting a Boombox again? What’s it been, five or ten years? A lot has changed about the technology with a Boombox. The quality of sound, the options of MP3 playing, tons of features on the remote—but the one dynamic about the Boombox, that hasn’t changed, is the size! That’s why you have always loved using your Boombox, because it doesn’t take up the whole living room, and it’s simple to transport. The Panasonic Rx D55 review is on the higher end as far as the portable Boombox market and price is concerned. But it’s well worth the price because of the variety of features that go along with it. You will get a complete, quality surround sound because of the two-4 way speakers built into it. You can adjust the sound quality on this as well as desired. It has five settings; Heavy, clear, soft, vocal, and EQ-off. The speakers off you a full range of sound. If you are a fan of Mp3’s, then this is going to be a device worth checking out. Download your favorite songs, then plug your USB cord into the RX-D55 for a more complete sound. You can play up to 2500 tracks and 255 albums! Portable means take it anywhere with you, which is a nice luxury to have. If you have a cool employer, you can take this light-weight Boombox with you to the office. Yes, this Boombox is wireless, which means no annoying cords. The AM/FM features allows you to program or pre-set all of your favorite radio stations. If you are like me, then you probably have about 8 or 9 stations you like listening to. The Panasonic RXD55GC takes care of that for you by giving you the ability to pre-set up to 16 radio stations. The remote is going to give you 31 functions to perform. If you are like most people I know, then a quality remote is a must. Most people don’t want to be bothered to get up and change the track of the album. With this portable Boombox, you have the luxury of controlling everything on the unit from anywhere. If you still enjoy going to the music-store and buying a CD, the RX-D55GC-K has you covered. The unit can access up to 99 tracks, program up to 24 track, and gives you a couple programming mode options. You can hit the “random track” or you can do the standard “track” selection. Yes, it gives you the elapse time, and time remaining. There are tons of benefits to using this Boombox. One, it’s a Panasonic, yes it’s a little costly, but it does so much for you, and it’s a quality product. With the USB connector, giving you the MP3 option, you now have more than just the CD, Tape, and AM/FM option. Headphone Jacks let’s you go private while listening to your favorite songs. Clock and time setting is easy to program and you have the luxury of knowing the time. AM/FM program up to 16 radio stations. 2-Four way speakers giving you a complete full range, and surround sound. Plug in or cordless battery powered. There are tons of advantages with this Boombox. You can take it anywhere at any-time with you. Whether you want to take it to work, to the park, or walk with it, you have that option. It is light, only weighing ten pounds. It comes with so many functions, like the MP3 capability, that yesteryear Boombox units never had. The sound quality is another advantage that customers rave about. 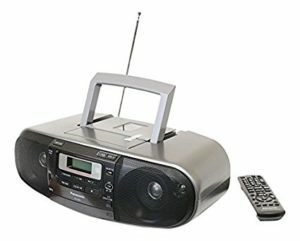 For a Boombox, you certainly feel like you are getting the experience from a high-quality CD player.The remote control is also a great advantage to have with this unit. You can control your tracks with comfort and ease. The other thing customers love about this unit is the user manual. The user manual? Yes, the user manual is in-depth, a step by step guide on how to easily program your unit. If you want a Boombox that is going to last you a while, then the Panasonic RX-D55 Boombox is for you. You will have to bring your checkbook to the counter, as it will cost you over $100 bucks. That said, you are getting a bang for your buck. You get the quality of sound, the flexibility of different formats, a variety of features that will enhance your experience while listening to your favorite tracks! You can record music, you can plug in your mobile device and load thousands of tracks, program up to 24 tracks with the CD option, and easily listen to all of the radio station you like without the tuning hassles. Along with the portability of this unit, you can take this with you on trips, vacations, or simply room to room with you. You can find a decent Boombox at Wal Mart or online for cheap. But how long it lasts, and what options and quality it gives you—is likely not long and less variety. When you think of quality, the Panasonic RX-D55GC-K is going to be part of that conversation. If you’re like me and work hard for your money, you expect the best for your dollar. This Boombox gives you the best of many formats; MP3, CD-R, CD-RW, AM/FM, Cassette.